Millions of blog posts are being written every day for various blogs across the web. One of the obvious facts that new bloggers learn quickly is that not all blogs and blog posts get equal attention. On a particular blog, some blog posts get more attention than others. There are some blog posts on this blog that always get more traffic than others. There are also some blogs that get more traffic than other ones. Out of all of the blogs I have, this one is by far the most successful. The amount of traffic your blog gets is dependent on social media and SEO. Social media covers the sharing aspect and growing an audience on the networks you use. However, SEO is a much deeper concept that a select few understand. To everyone else, it looks like the extensive math problem that takes up the entire chalkboard. Understanding SEO is important because it is a big avenue for traffic. Some people get thousands of daily visitors from SEO which means it is valuable. 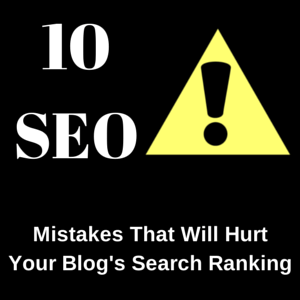 Although SEO is not exactly the do or die stage of a blog, it is important, and here are 11 mistakes you need to avoid so your blog can have better SEO. #1: Not submitting your blog’s sitemap to Google. One of the reasons why blog posts do not get SEO traffic is because they are not even indexed by Google. A sitemap presents all of the contents of your blog in a way that makes it easier for Google to read them. Submitting your blog’s sitemap to Google will allow them to properly index your blog posts. Indexing your blog posts on Google makes it possible for anyone to find any one of your blog posts with a particular search phrase. There are many options for creating your own sitemap, but out of all of the options, the Google XML Sitemaps WP plugin is the easiest to use. This plugin makes it easy to create an XML sitemap to submit to Google so all of your blog posts can be properly indexed. Once you get your sitemap, head over to Google Webmaster Tools and submit your sitemap. Actually, there is no difference, and that’s the problem. Search engines see http://www.example.com and https://www.example.com as two different websites with identical content. This is duplicate content that search engines associate with plagiarism. As a result, your SEO ranking will go down for both the http and https versions of your website. In order for you to identify whether your blog has this problem or not, simply enter http:// before your blog’s URL. Then, do the same thing but with https:// in the front. When you do this, check your URL for spelling because you do not want a misspelled URL to give you the wrong webpage. Your SEO is doing just fine if one of the two options worked. If both options work, then your blog’s SEO is getting hurt. For a WordPress blog, you can change your blog’s URL by going into settings–>general. Then, you can change your blog’s URL to your preference so people can either use http or https to access your blog. Visitors should not be able to use both http and https to access your blog. Search engines have a big responsibility in organizing billions of blog posts based on popularity, keywords, and value. Although search engines have this big responsibility, they struggle to understand a majority of blog posts. The reason why some valuable blog posts are not getting any search engine traffic is because they do not have meta tags. I got introduced to meta tags more than a year and a half after I created this blog. I had to go through every blog post I ever wrote and add meta tags to them all. It was painstaking work that took several months of my time, but it was all worth it. My search engine traffic jumped up significantly after making the change. Any of my blog posts that were already doing good traffic from the search engines got a big jump in traffic. I use the Add Meta Tags WP Plugin to add meta tags to all of my blog posts. I include keywords in these meta tags so search engines can pick up on them and promote my content. Meta tags, especially the meta tags with the right keywords, make it easier for the search engines to understand what your content is. Google sees your blog completely differently from you. It does not see the colors and pictures that may be on your blog posts. In order to make it easier for Google to see the way your blog looks, use the data highlighter in Google’s webmaster tools. Once you verify your blog, the data highlighter will allow you to let Google know how your blog looks (pictures, text, author name, etc). Using the data highlighter only takes 10-15 minutes, and it can have a big impact on your search engine traffic. Your blog’s bounce rate allows search engines to identify how interesting your blog is. If your bounce rate is 100%, that means people are visiting your blog and then leaving without reading another article. A high bounce rate is bad for SEO and results in fewer conversions. In order to see where your bounce rate is at, verify your blog with Alexa and then see their stats. Your blog’s bounce rate should be under 70%. A bounce rate under 70% means that at least 30% of your visitors are reading multiple articles on your blog. The lower you can get that bounce rate, the better your SEO and conversions will be. Redirect people to another page on your blog after they subscribe. This page should contain links to the best content on your blog. Most people do not see a sudden drop in their bounce rates. It takes a few weeks before seeing a significant drop in your bounce rate, and when I say significant drop, that usually means a 5-10% drop. Getting your bounce rate under 60% means you are moving in the right direction. For a long time, keywords were the focal point of SEO. If your blog post had a lot of keywords, it would be on Page 1. If I decided to write the word “SEO” 100 times in all of my blog posts about SEO, those articles would have been #1 on Google. However, many people abused this rule, and Google sent their panda after those people. Many blogs suffered under the wrath of the panda, even the blogs that were getting millions of daily visitors. If you try to stuff your blog post with keywords, then the search engines will make it more difficult for people to find your content. The worst part about keyword stuffing is that there are many offenders, but few people know that they are breaking the rule. My rule of thumb is to never use the same keyword twice in the same sentence. Synonyms are also very useful. If your keyword is “giraffe,” you can refer to the giraffe as an animal in one of your sentences instead of referring to it as a giraffe in every sentence of your blog post. Using synonyms to replace keywords will boost your blog’s SEO. Anchor text is any clickable text in your blog post that leads to any webpage. In this sentence, “10 Easy Ways To Enhance Your Blog’s SEO” is anchor text. It is a clickable link that leads to another webpage. Anchor text is great for SEO and bounce rate, but having too much anchor text in one blog post can also be harmful. The search engines won’t like it if you have dozens of anchor text links in the same blog post. However, there are worse consequences of having too much anchor text. The success of a blog all depends on how many visitors it gets and what those visitors do when they get on your blog. If you have dozens of anchor text links in your blog post, it will be more difficult to read. I make my blog posts as easy to read as possible by writing short paragraphs and only having some anchor text. Imagine how different the reading experience of this blog post would be if every other sentence was anchor text. For the average person, it would be too much to bear, especially when there are other blogs on the web without that much anchor text. Most of the comments you will get for your blog will be from spammers who are promoting their links without even bothering to read your content. New bloggers who want to boost their social proof often make the mistake of approving these comments. These bloggers reason that, based on the numbers, it is better to have 1,000 spammy comments than 10 real comments. Having 1,000 comments indicates a popular blog, but the search engines know better. Not only are the links from most spammy comments bad (i.e. Get 5000 Twitter Followers For Just $3), but when engaged readers think of commenting on your blog, they get to see all of the spammy ones first. Would you want to comment on a forum group where all of the members were saying things like, “This is the magic pill that will make you lose 100 pounds in 10 days,” or, “Get a six-pack in six weeks”? You will lose the type of interaction that matters–the one between you and someone in your targeted audience. Social media is anything but a fad. It has completely transformed businesses and allowed blogs to suddenly become popular. The main reason this blog is popular is because of my Twitter presence. My SEO traffic has really been kicking in lately, but that is because I also get traffic from Twitter. Every day, I am getting hundreds of daily visitors from both Twitter and the search engines. In addition to boosting your SEO traffic, social media allows you to interact with your targeted audience. I have made many wonderful connections on Twitter. Some of these people share my blog posts and buy my products. Social media is one of the most valuable traffic generating assets known to mankind. Backlinks are one of the most intriguing parts of SEO. When people think of backlinks, they think of the old and worn out practice of buying backlinks in bulk. Google caught on, and now the mighty search engine measures backlinks by quality instead of quantity. When Google caught up to backlinks and declared quality over quantity, many people assumed that backlinks were simply dead. For a very long time, I assumed backlinks were dead just like many people who read contradicting advice on the web. If you still believe backlinks are dead, take a look at the Alexa ranks for the most popular blogs on the web. Then, scroll down to see how many backlinks they have. Most of the popular blogs that are getting thousands of daily visitors also have thousands of backlinks. If you want to get more backlinks for your blog, implement these tips. SEO is a powerful way to get more traffic from your blog. Many of the mistakes people make are based on misconceptions and contradictory advice. I have tested various methods to boost SEO, and these are the good ones. However, SEO chances rapidly, and the methods to boost SEO are always subject to change. You want to implement the methods that work now before Google changes the rules again with another panda attack. Implementing the methods now will allow you to get more visitors and allow more people to remember you. That way, if Google levels the SEO rules again, you’ll still get a lot of traffic from the people who remember you.